This beauty was added to our collection because sometimes you want a little extra! 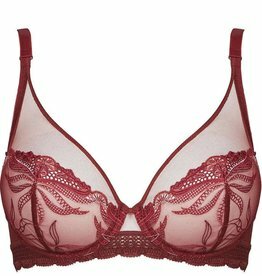 The Simone Perele Kiss push up bra enables you to sculpt your bust. The lace effect elastic band underlines the bust and decorates the straps. Guiding your bust up and in, this bra centres the volume of your bust for a sensually plunging cleavage. The Red colour is blue based and can even be worn under white. Looks best when worn as a set, we recommend buying 2 briefs for every bra, because life is better when your underwear matches!